As students at The Perch, the upper campus dining hall, finish their dinners and drop off their plates and utensils, they hear a familiar voice ringing out without fail from behind the drop’s wall. “Thank you, have a good one!” the voice calls to each and every plate. 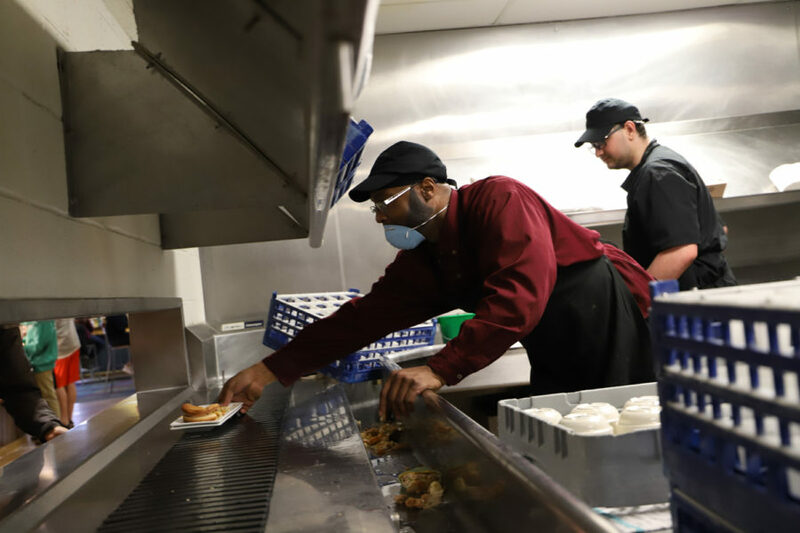 Dining worker Elliot Jones is the source of the disembodied voice from behind the wall, and he hopes a small act of kindness will help to brighten students’ days. Jones, who has worked at The Perch for about four years, said his positive outlook is mostly drawn from early interactions with his mother, with whom he regularly attended church. “I think the consistency through her, and with the joy of the Lord, and what it gave her, I think it just trickled down over to me, you know, and to my other siblings as well,” Jones said. Jones was born and raised in Homewood, a Pittsburgh neighborhood located about 20 minutes east of Oakland on the 71D. He grew up as the youngest of four children — Jones has two older sisters and one older brother — under the wing of his single mother. Jones had a close relationship with his mother, but his father wasn't present for much of his youth, something he’s disappointed about.. The two men later regained contact, he said, but the emotions from his youth were difficult to overcome. He attended the public Homewood Elementary School and got involved in the music program. While in fourth grade, Jones said his music teacher recognized his budding musical talent and pulled him and a few friends aside to teach them how to play small xylophones. At an elementary school graduation, they performed a small set for the audience. For high school, he attended both the Pittsburgh Westinghouse Academy and Pittsburgh Creative and Performing Arts School, spending half a day at each. Jones continued his music studies, learning the tenor saxophone, oboe and clarinet. Jones said that, as he aged, he began to realize his life philosophy differed greatly from that of the environment where he was raised. After graduating high school in 1987, Jones decided to make a career out of his people skills and started to work in the health care industry. He trained in trade school to become a certified nurse assistant, and later worked as a licensed practical nurse at several health care facilities in the Pittsburgh area, helping geriatric patients. Jones said when he first started at some of the homes, the residents were bedridden, and were not being properly encouraged by the staff. He noted that, in some cases, staff members viewed their job as just a paycheck, and didn’t show as much compassion or concern for others. But the patients’ health began to improve once he got involved. Jones said when he worked to support and uplift the residents, they reciprocated and helped to uplift him. “I think those were phenomenal times in my life, to see a person who was in a bed, really, basically, feeling hopeless and has given up, to feel hope again and to want to do again,” Jones said. Now, through his work at Pitt, Jones said he still attempts to keep up his positivity even as he has moved through several different positions. Jones said it doesn’t bother him that he rarely gets to see those he encourages every night face-to-face. For him, the words themselves are just as important than seeing who he’s speaking them to. 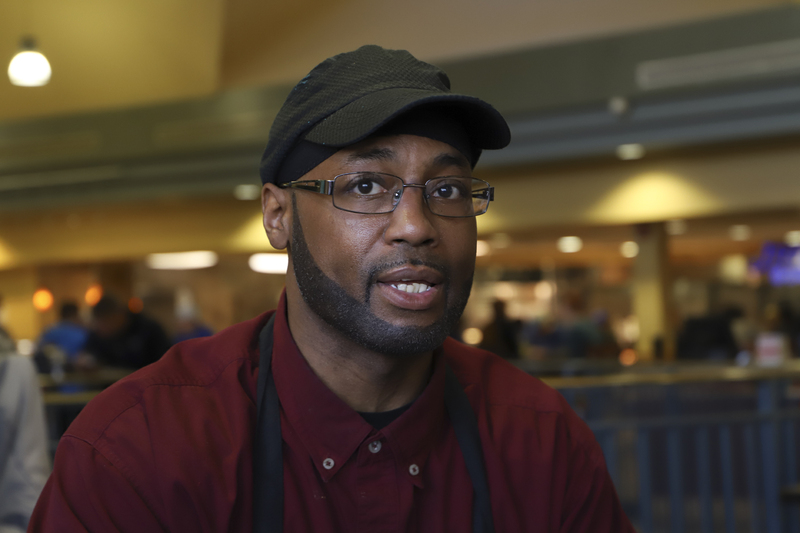 Some of Jones’ coworkers at the dining hall said his upbeat spirit spreads to the rest of the staff. Mary Carter, a cook at The Perch, said working with Jones is “a lot of fun” and that he brings a positive attitude to the dining hall. Carter, a native Pittsburgher who has been working at The Perch for about four years, added that Jones always makes himself available to coworkers in case they ever need assistance. The Sutherland Hall Council, part of Pitt’s Resident Student Association, recognized Jones in March as an exemplary member of the residence hall community. Olivia Mania, the council’s recognition chair and a first-year political science major, said Jones brings joy and a positive attitude to the students he serves. Mania, a resident of Sutherland West, added that Jones’ remarks are a common point of connection for residents across the two wings of Sutherland Hall. Reflecting on his philosophy, Jones said everyone should make treating their fellow human beings with kindness part of their daily routines and how they live their lives.